We’d love your help. Let us know what’s wrong with this preview of Running Out of Space by S.J. Higbee. Lizzy and her friends weren’t looking for trouble – all they’d wanted was to prove that fertile English girls could handle themselves when on shore leave without being accompanied by a sour-faced chaperone and armed guard. Looking back, maybe taking a jaunt off-limits on Space Station Hawking wasn’t the best idea – but no one could have foreseen the outcome. Or that the consequences of that single expedition would change the lives of all four girls, as well as that of the stranger who stepped in to save them. To ask other readers questions about Running Out of Space, please sign up. When I first started reading this I found it kind of hard to connect and get involved in the story. It was slow going. But, I have to say this may be because of coming down from a book hangover or even my mood. I did have a bit of a book hangover before I started this one. So, I would never take stars off for my problems getting into it, because most likely it was not the failing of the author. Elizabeth or Lizzy, as she is most commonly referred to, is a wonderful protagonist. My favorite kind a When I first started reading this I found it kind of hard to connect and get involved in the story. It was slow going. But, I have to say this may be because of coming down from a book hangover or even my mood. I did have a bit of a book hangover before I started this one. So, I would never take stars off for my problems getting into it, because most likely it was not the failing of the author. Elizabeth or Lizzy, as she is most commonly referred to, is a wonderful protagonist. My favorite kind actually, because though she is a strong person, she is also very real and flawed and weak at times. She is someone I feel I can truly relate to, I feel like I can step in to her character and live through her eyes as I read the book. I laughed with her, struggled with her, rolled my eyes, flushed my cheeks, fell in love, held back my tears, then cried them into my pillow with her. Lizzy was a character who went through so much, and came out of it with tremendous growth in a short period of time. I thought this book excelled in character development, which makes me happy because I’m totally a character driven reader. As far as world building, I struggled a little with picturing the surroundings. And in science fiction world development is usually dominant, which can drive me crazy. I like to be able to picture the surroundings, but I don’t need to know all the technical details. Sometimes I felt myself able to picture things better than others. So, I’m not saying it’s non-existent here, but I would like to have had a little more. But over all the book works. The strong characters really carry the book, especially Lizzy. I’m so glad I had that opportunity to be able to read it!! I’m looking forward to reading the next one in the series. Running Out of Space is the first book in S.J. Higbee’s Sunblinded series. It’s one of those books where I’m a bit torn when it comes to giving a rating, as in the end I’d like to give a point-five-star rating. Therefore, even though I have given it a three-star rating, know it is more of a three-point-five star read. In truth, I was a little bit unsure about whether or not I wished to read this one. A part of me was intrigued, but another part of me was unsure as to whether it was really for me. Running Out of Space is the first book in S.J. Higbee’s Sunblinded series. It’s one of those books where I’m a bit torn when it comes to giving a rating, as in the end I’d like to give a point-five-star rating. Therefore, even though I have given it a three-star rating, know it is more of a three-point-five star read. In truth, I was a little bit unsure about whether or not I wished to read this one. A part of me was intrigued, but another part of me was unsure as to whether it was really for me. Although I enjoy a good science fiction read, I am very particular about the science fiction books I pick up. When it comes to finding new authors in the genre, I’m especially nervous. I have such a long list of expectations when it comes to science fiction, and I’m never sure whether all the boxes will be ticked. Running Out of Space did tick many of my boxes, but at the same time I wasn’t completely happy with the story. I think the biggest issue I experienced occurred at the start of the story. We dive straight into the story, which is wonderful, but I never really felt as though I understood the world we were in. I’m a huge fan of world building, and what occurred within this story felt like too little too late. If the truth is to be known, I had to double check to make sure I was reading Running Out of Space and that I hadn’t accidentally picked up Dying for Space by mistake. I love it when books throw us right into the action, but it was far too long before I had a solid image of the world in my mind. By the end of the book, I still had some questions, but what I did understand I really enjoyed. Another element I really enjoyed is how well everything in this story came together. I was fearful at times, as I was never entirely sure as to where the story was going. There were so many storylines that I found myself questioning what kind of science fiction book this was to be. There was drama on so many different levels, multiple different elements were introduced, and I wasn’t sure what the story was building towards. When things did come together, when everything was put together at the end, it was wonderful. There are more things than I could list introduced throughout this one, and they all came together so well. At times I felt as though it was a bit much for one book, but I really do appreciate the way everything came together. I used to avoid science fiction books. Figured they’d be full of techie jargon I couldn’t get my mind around. Then I gave it a go and found some fun books, including this one by S.J. Higbee. She does a great job of making me feel comfortable and before I know it, I’m not thinking about genre. I’m thinking about the characters. The trouble they get themselves into. What’s waiting for me on the next page. And almost forgetting that this takes place in space. So, yeah, four young ladies, Lizzy, Sonj I used to avoid science fiction books. Figured they’d be full of techie jargon I couldn’t get my mind around. Then I gave it a go and found some fun books, including this one by S.J. Higbee. She does a great job of making me feel comfortable and before I know it, I’m not thinking about genre. I’m thinking about the characters. The trouble they get themselves into. What’s waiting for me on the next page. And almost forgetting that this takes place in space. 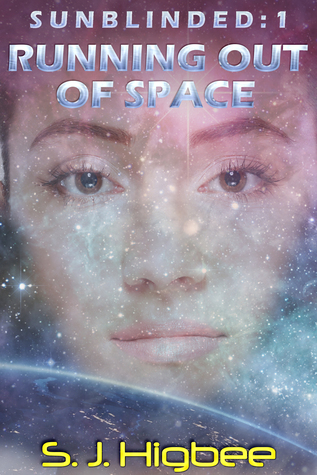 So, yeah, four young ladies, Lizzy, Sonja, Jessica and Alisha, decide to prove their more than baby ovens and head into the forbidden and dangerous Basement Level on Space Station Hawking to prove they’re every bit as tough as the guys. This is where the action starts and keeps going all the way til the end. With four main character’s, all of them girls, you’d think their voices would run together, but they don’t. They each have their own signature and you easily know who’s talking when. All are quite different in personality, have different strengths and weaknesses, and this actually makes them a strong team. When they get into some serious trouble, a stranger steps in and helps them out. Yep, a male character, Wynn of the muscles and sky blue eyes, joins the team. Not so much by choice as by circumstance. This doesn’t mean the girls go all wimpy. They actually step up and become double tough when the danger gets really intense. His character made for some fun to lighten things up here and there. And while there’s a quick attraction between one of the girls and Wynn, it’s not the main focus of the story. And from the author’s description of Wynn, I wouldn’t blame any of the young ladies for swooning over him. Reading this story was like getting a tour of the station. From bottom to top, each level is different. Some are nice and some are nasty, and I could easily picture much of it. Probably because of all the sci fi movies I watch. Good visual writing added to my enjoyment. The author gave me plenty of action and intrigue and some genuine characters that are easy to tell apart. Solid science fiction fun. I see this is the first in a series and I’ll be waiting for more. The action is full on from the very first page of this read. The majority of the story takes place onboard a spaceship run by an uncompromising military minded captain. There’s tension between characters from the get go as the feisty babes’ forbidden territory shore leave jaunt finds them in a very tight spot. As Lizzy is desperate to shrug off her fertile female label, be an officer and love whomever she pleases, there are echoes of The Handmaid’s Tale. Fertile women are essentially used as bre The action is full on from the very first page of this read. The majority of the story takes place onboard a spaceship run by an uncompromising military minded captain. There’s tension between characters from the get go as the feisty babes’ forbidden territory shore leave jaunt finds them in a very tight spot. As Lizzy is desperate to shrug off her fertile female label, be an officer and love whomever she pleases, there are echoes of The Handmaid’s Tale. Fertile women are essentially used as breeders and their value as anything else in society is discounted. The book tells the classic tale of corruption at the top. Themes revolve around the desire for independence, the value of fertility, discrimination, domestic abuse and the misuse of power. A good fast paced read with some uncomfortable issues as part of the plot. I’m invested in Lizzy now and would most definitely want to read more in the series. I really liked this space opera. It's well-written and hard to put down once you start reading it. Lots of adventure, tense moments and good world building. Elizabeth is a great character. I like that she's self-confident and strong and that her first reaction is to defend those in trouble. However, she's a nuanced character because even though she's self-confident and even though she see's her own weaknesses she can still be blindsided by them. I can't wait to read more about her. Full disclosur I really liked this space opera. It's well-written and hard to put down once you start reading it. Lots of adventure, tense moments and good world building. Elizabeth is a great character. I like that she's self-confident and strong and that her first reaction is to defend those in trouble. However, she's a nuanced character because even though she's self-confident and even though she see's her own weaknesses she can still be blindsided by them. I can't wait to read more about her. Fast paced story with interesting characters. The life style on the ship's and the planet's work to help reader understand feeling of people. Firmly set in a believable future (in the best tradition of "what if")a young woman discovers secrets about her life. When I read read the blurb for Running Out of Space by S. J. Higbee I knew I wanted to be apart of the blog tour and review it. I am so glad I signed up to host! I really enjoyed this first installment of the Sunblinded trilogy. I enjoy when a world is set in the future. It is always fun to see how the author sees it from their PoV. Running Out of Space is no different. The world is interesting and I can not wait to find out more as the series continues. I like the idea of traveling through space and landing at different places. It reminds me of a pirate novel of sorts, only set far into future. The cultures are also intriguing. They really come to life throughout the novel and are varying, but so different from anything we know. Elizabeth Wright is a great main character. She is adventurous and brave. She is a leader whether she realizes it or not, and wants to go against what is expected of her to become an officer on a merchant ship. She is loyal to those she loves, and will do anything to protect them. Even if it means sacrificing herself in the process. Her family dynamics, and how she handles everything that gets tossed at really shows and defines her. I would recommend this to anyone who likes fantasy, futuristic, or sci-fi. It really is a fun read that kept me enthralled. I look forward to the character growth and discovering more about Elizabeth Wright's surroundings. Well written but found it too depressing. Reminded me a bit of Margaret Atwoods "The Handmaids Tale". Certainly conveys how trapped the main character is. Just too dark for my taste. Born the same year as the Russians launched Sputnik, I confidently expected that by the time I reached adulthood, the human race would have a pioneer colony on the Moon and be heading off towards Mars. So I was at a loss to know what to do once I realised the Final Frontier wasn’t an option and rather lost my head - I tried a lot of jobs I didn’t and married a totally unsuitable man. Now I've final Born the same year as the Russians launched Sputnik, I confidently expected that by the time I reached adulthood, the human race would have a pioneer colony on the Moon and be heading off towards Mars. So I was at a loss to know what to do once I realised the Final Frontier wasn’t an option and rather lost my head - I tried a lot of jobs I didn’t and married a totally unsuitable man.